It's been a long time since I've done a TODAY: tonight post on my blog. Heck, it's been a long time since I've blogged! Is blogging still a thing? Do people do it? Am I even a person? Is existence real? What are these deranged words I'm writing? Clearly I'm out of practice. Let's stick to food. My "TODAY: tonight" series is made up of the recipes Carson can't stop talking about when he comes home from work. Even though I haven't been documenting all of them, I've actually made quite a few lately, but this one... this one deserved a post! 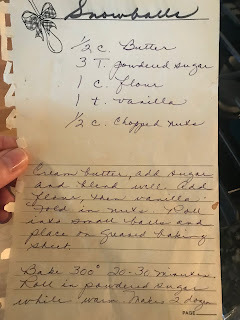 There is so much going on in this recipe, I'm not sure what I should discuss first. 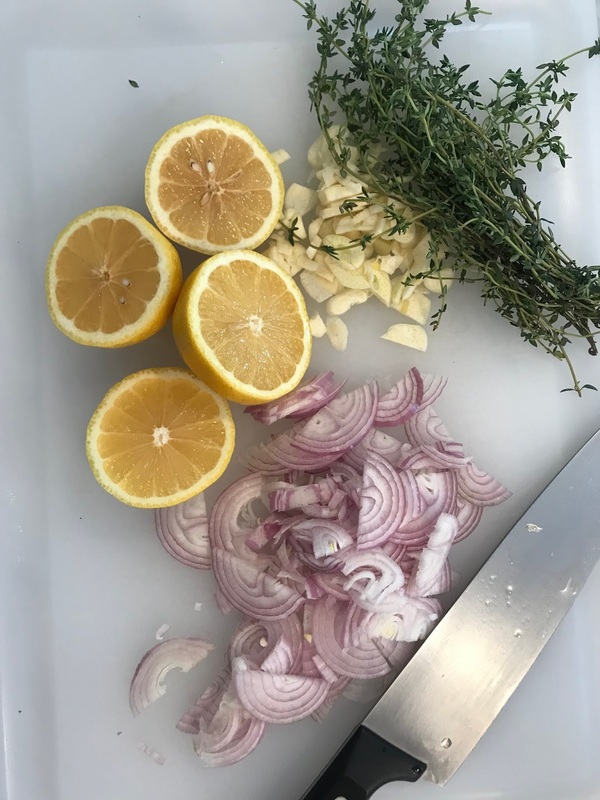 Should I start with the flavorful, mustard-based marinade that soaks through the chicken thighs for hours, or should I talk about the bed of roasted vegetables that perfect each bite? 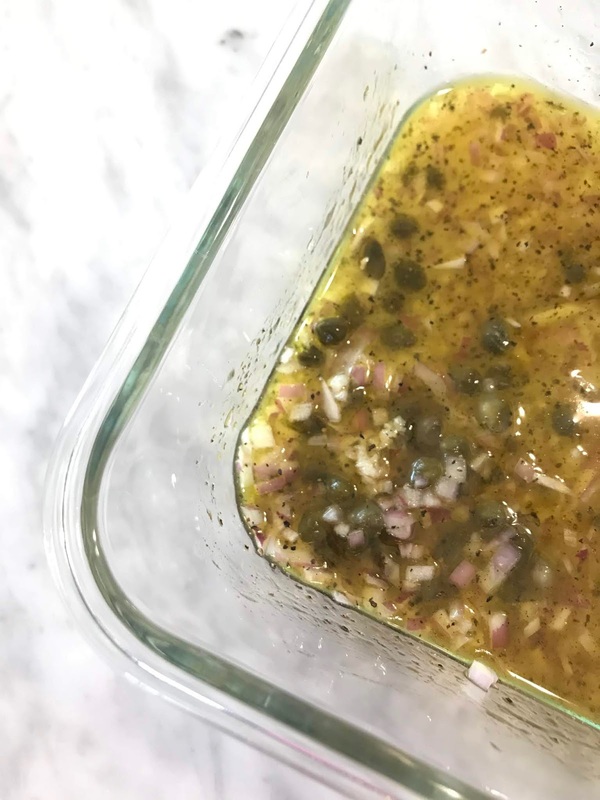 I MUST tell you about the method of draining the solids from the liquids in the marinade and using them both to create this rich, sublime glaze. 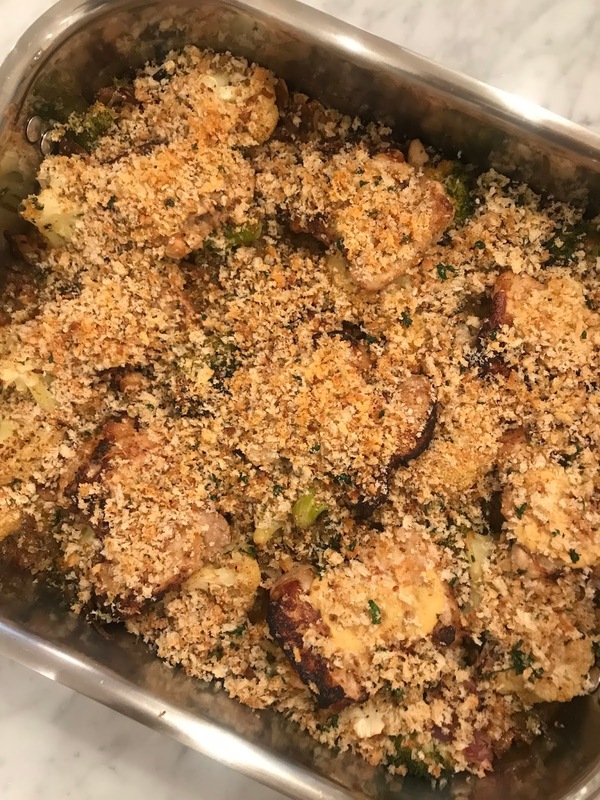 And, there's obviously the crunchy, homemade topping that I could write a song about, IF I was the type of person to write songs about food (I am). My favorite part of the recipe, however? How adaptable it is. It's a warm, comforting dish that leaves you completely satisfied without feeling heavy. 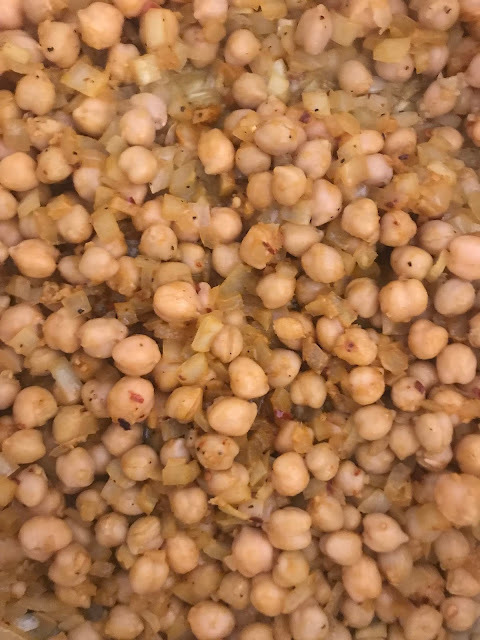 The chickpeas are perfectly seasoned with a spicy kick (I cut the red pepper flakes in half, however, because I'm a wuss). The fresh ginger is a must, as it brightens up the stew and adds flavor. And the coconut milk...oh the coconut milk. Apparently there's a controversy over how many cans to use: 1 or 2. I followed the recipe and used 2 cans and I wouldn't change a thing. It smooths out the soup and adds a lovely depth. Finally, the kale thickens the soup and makes you feel super healthy! 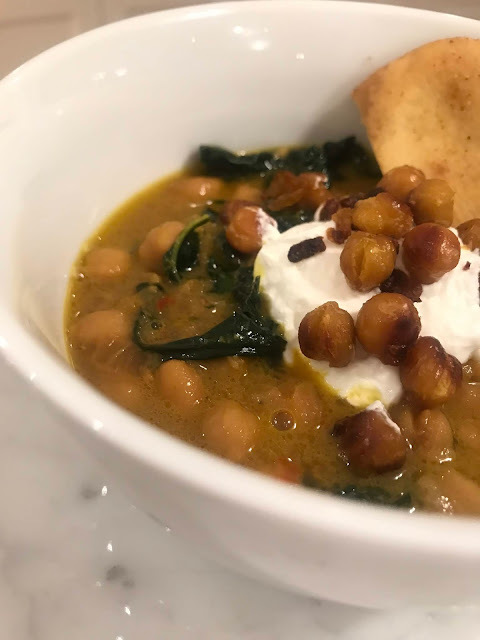 I topped mine with crispy chickpeas and greek yogurt - which I highly recommend. Alison Roman, the cookbook author, Bon Appetit contributor and NY Times columnist responsible for the recipe, also went viral with this recipe for her Salted Chocolate Chunk Shortbread Cookies. Try those as well, you won't be sorry. Is January over yet? No, it's only halfway through, you say? WHAT IS HAPPENING. Christmas was 79 years ago. How is it only January 17th. I suppose it's a good thing that January lasts an eternity, because it takes me 79 years to get back into a decent routine. I finally feel like I've recovered from the madness of the holidays and am capable of cooking, working out and returning emails. Just in time for a 3-day weekend and blizzard... yeesh. But, will it be a blizzard? The weather people are like, we'll get somewhere between 0 and 9 feet of snow. Enjoy. I guess I should rush off to the market to buy 29 gallons of milk as people tend to do before "possible" snow storms. 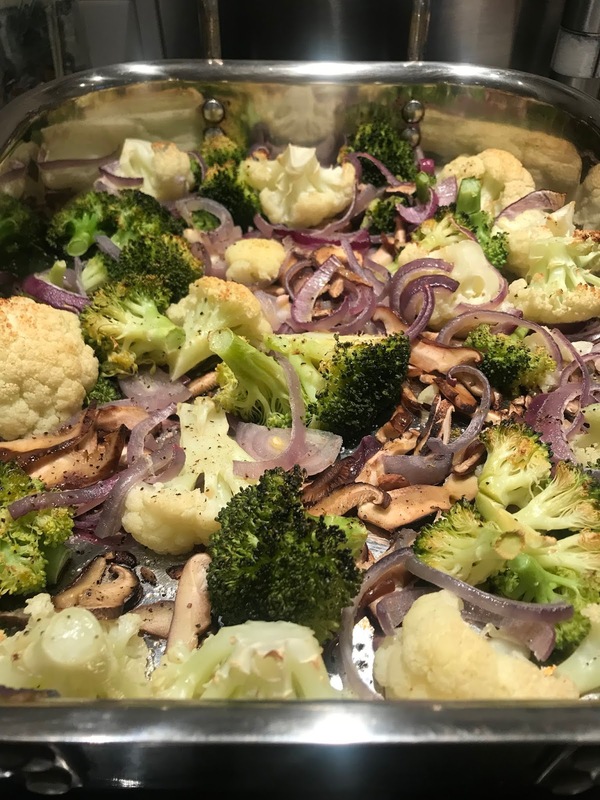 Or, I could stick to buying vegetables and polenta so I can make this delicious side dish again.! Carson and I loved the combination of sweet, roasted vegetables and buttery polenta, all topped with a bright, salty vinaigrette. 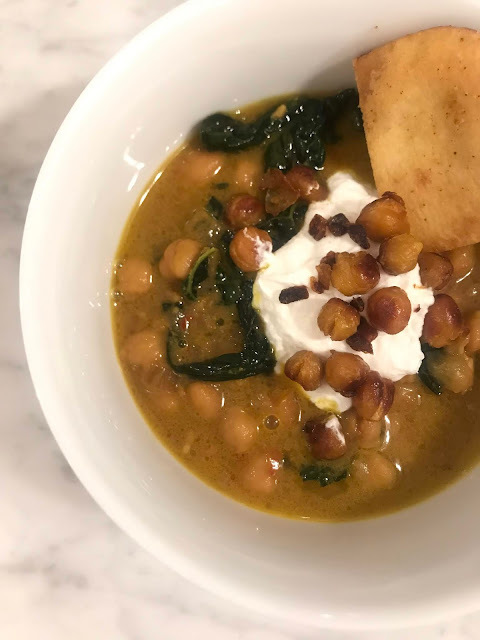 We served it alongside salmon, but you could also add beans for protein (this recipe does that, which I loosely based the dish on) and make it a Meatless Monday dinner. I hope you enjoy it, and stay safe and warm this weekend with your gallons of milk. Mix 2 tablespoons oil, lemon juice, capers, shallots, garlic and salt and pepper in a small bowl. Set aside. Preheat oven to 375 degrees. On a buttered baking dish, lay out polenta. Slice the 2 tablespoons of butter and place a sliver on top of each piece of polenta. On a baking sheet, arrange the vegetables. Add the remaining two tablespoons of oil, season with salt and pepper, and toss to combine. 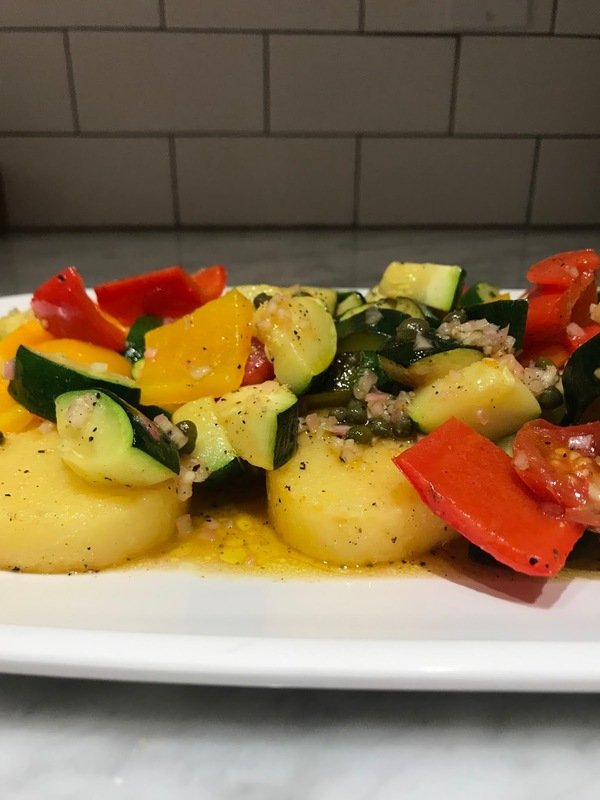 Place both vegetables and polenta into the oven, and cook for 20 minutes, flipping the polenta and tossing the vegetables halfway through baking process. Once cooked, arrange polenta and veggies on a platter and drizzle with lemon caper vinaigrette. There's something about the countdown to Christmas that makes me want to bake something every single day. I literally have pounds of butter in my fridge and 12 different kinds of chocolate chips in my pantry to fuel this desire, but life keeps getting in the way which is super annoying. If I could, I would cancel all plans and permanently affix holiday pajamas to my body and eat butter. I mean, bake with butter, and then eat what I bake. Alas, I have to be a mom and a wife and buy presents and work and attend parties and concerts and exercise so I can eat said amounts of copious butter. Preheat oven to 375 degrees. Whisk together flour and baking soda, set aside. Mix melted butter, both sugars and molasses. 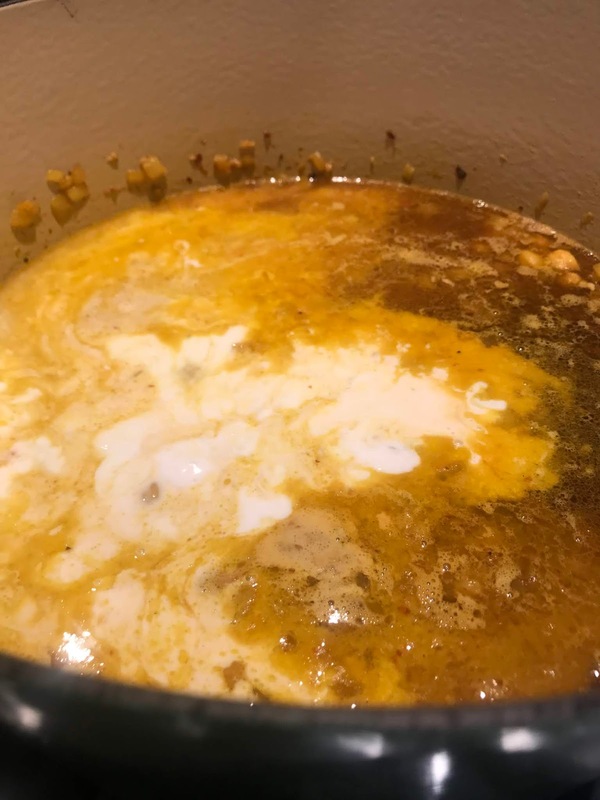 Add egg and beat 1-2 minutes. Add spices, salt and fresh ginger. Fold flour mixture into wet, just to combine. Place raw sugar in a shallow bowl. Scoop tablespoon sized gobs of cookie dough and roll into balls. If the dough is sticky, throw it in the fridge for a half hour. Roll the balls in sugar and place on lined baking sheets 2" apart. Bake, rotating halfway through, for 7-10 minutes. They should be puffed and a little cracked on top, slightly set around edges. With the back of a ladle or spoon, press gently into the top of each baked cookie fresh out of the oven to encourage a chewy center. Is there anything better than a handwritten recipe, all worn and smudged with buttery fingerprints? 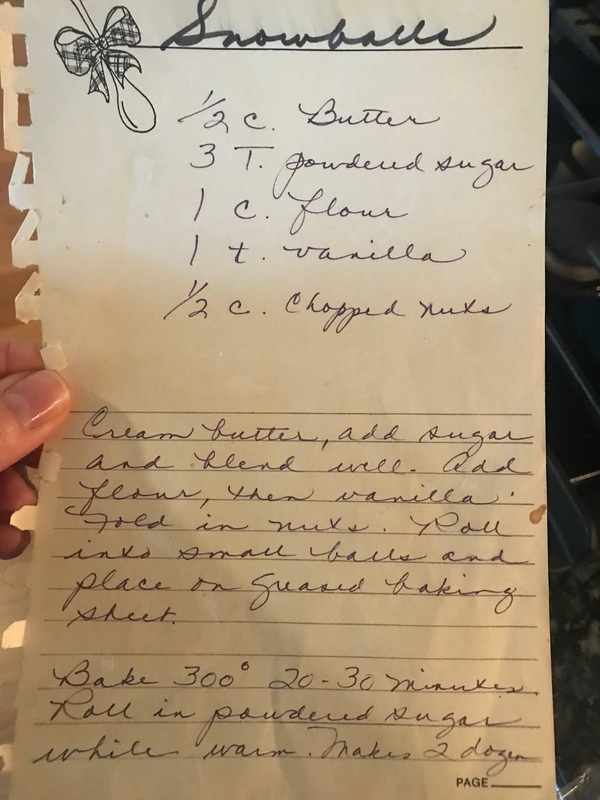 When I posted my late mother-in-law's recipe on Instagram, so many of you wrote that the writing looked identical to one of your own loved ones. Why is that?! It seems there was something so universally elegant about the cursive back in the day... it just seemed to dance on the page. I don't think I could replicate it if I tried! Also, how do you write a cursive 'Z'? I have no clue. During the holidays, I always look forward to pulling out these passed-down recipes because, after all, traditions are what makes everything so merry! And I try to cling to the 'merry' as much as possible, because, you know... there's also the S T R E S S. But for that, there are cookies! Am I talking in circles? You know what I'm saying. Preheat oven to 300 degrees. Cream butter until light and fluffy. Add sugar and blend well. Add flour, then vanilla and fold in nuts. (Mixture will be crumbly but will come together with your hands.) Roll into small balls (about golf-ball sized) and place on greased baking sheet (I simply line mine with parchment paper). Bake for 20-30 minutes (I do 20). Roll in powdered sugar while warm, and then once more when they cool off. Sophie Boulos is a 16 year-old girl living in Montreal and is an extremely talented baker. Chiffon cakes, chocolate mousses, Belgian waffles, even homemade pizza...you name it, she's baked it! Besides being a skilled baker, she's an athlete, an active participant in various community services (such as animal adoption) and a nearly-graduated high schooler busy looking towards the future. We all know that teenage life can be stressful - especially the last year of high school - and Sophie turns to baking for comfort. While she finds the process calming, she also appreciates how gratifying it is to share her creations with friends and family, or even members of her community. How refreshing to see a young female driven with the desire to give back! And after one glance at her Instagram, I'd like to move to her community to be on the receiving end of such donations, thanks. 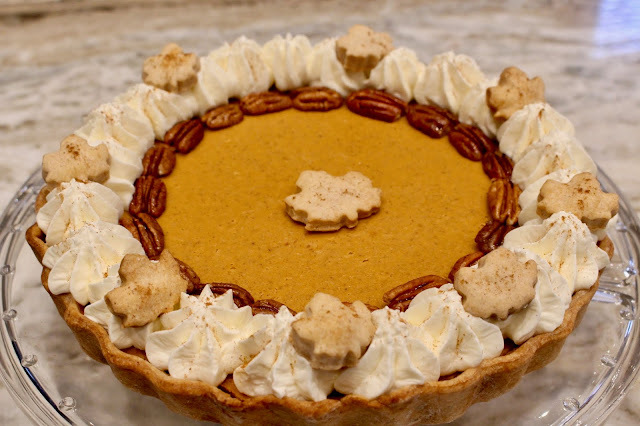 I'm particularly excited that she decided to bake a Pumpkin Pie for her Happen Bakers post, and not just because it's perfectly appropriate for this time of year (I wrote a lot of words that begin with 'P' in that sentence). If you've been a loyal follower of this blog, then you know it's the one food I just can't do...but my aversion shouldn't prevent you wonderful readers from acquiring a delicious recipe of the classic dessert! So, now you have one, and you have Sophie to thank. Thank you, Sophie! 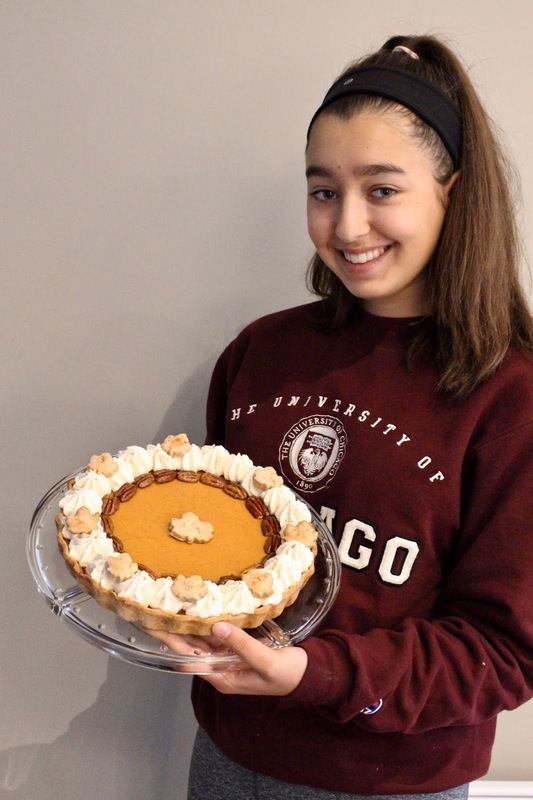 Read on for the recipe, and to learn even more about this talented young individual..
Click HERE to get the recipe for Sophie's Not Your Grandma's Pumpkin Pie! Everybody knows that grandmothers are some of the best bakers around. Their simple recipes make you feel warm inside and are very hard to beat. Now, I am not saying that their recipes get old, but sometimes making a few adjustments can turn a classic into something unique and out of this world. Being from Canada, I had to use maple syrup, and this addition is but one of the few simple changes I made to the original. This is the best pumpkin pie around! I've been in the kitchen ever since I can remember. There are even photos of me as a baby watching Food Network! Since my mom is a stay at home mom, I would spend lots of time with her cooking in the kitchen. I cooked much more when I was younger and started to bake pretty seriously starting at about 10 years old. What inspired me to start baking were my grandmothers, my mother and the Food Network. I learned on my own by watching TV shows, videos on YouTube and by practicing non-stop. 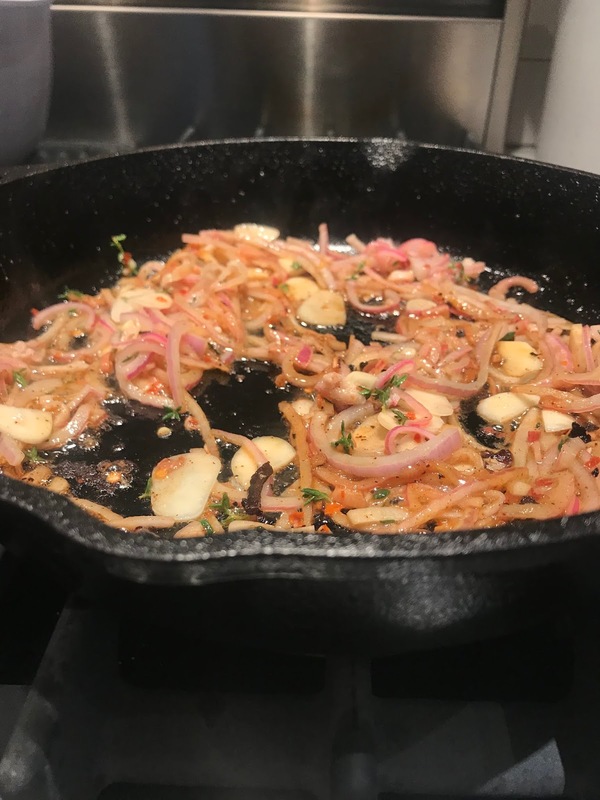 I also spent much time in the kitchen with my mom as a young child and was always eager to participate in the making of whatever she was preparing. My grandmother and I would bake mini muffins and other goodies from time to time, so baking definitely makes me feel nostalgic. The fact that it helps to relieve my stress when I'm feeling overwhelmed at school and it also allows for me to do something special for the important people in my life. For example, I bake all the time for people's birthdays at school and for my family and when I see the joy it brings them, that is the best feeling. I also love to give back to my community through my food and the joy a small gesture brings people never gets old. Definitely a chocolate soufflé and cherry clafoutis. Either anything with chocolate like a warm chocolate molten cake with vanilla bean ice cream or something lemony and delicious like lemon meringue pie. Definitely Ina Garten as I absolutely adore her and her recipes, Yolanda Gampp and Christina Tosi. I was baking some oatmeal raisin cookies and the first batch came out scrumptious. I forgot to set the timer for the second batch and by the time I remembered that they were in the oven, they had gone black! I love to listen to soul music and old classics. Anywhere from "I Feel Good" by James Brown to "Smooth Sailing" by Leon Bridges to "One Love" by Bob Marley. Probably Yolanda Gampp's channel, How to Cake It, because everything she makes is ridiculously impressive. Playing sports (soccer, volleyball, basketball, badminton, touch football), hanging out with my friends and my dog, volunteering in my community or painting. That's a really hard question because I'm graduating high school this year and am not quite sure what I would like to do just yet. In a perfect world, I would like to have completed my MBA and Juris Doctor as well as have graduated from the Cordon Bleu. I know that this is not realistic to accomplish in only 10 years, but I see myself attaining these goals eventually. I see myself remaining involved in my community and having a catering business where I can showcase my desserts and make some money to put towards my further education.